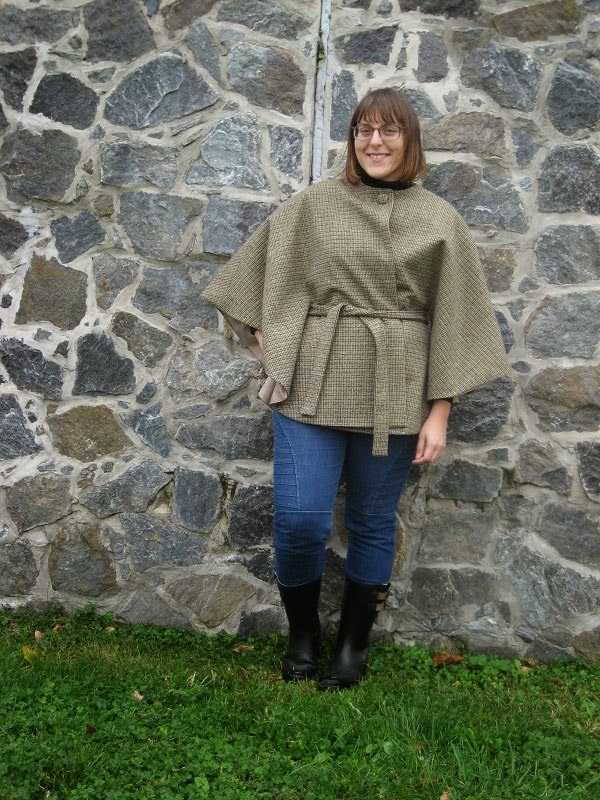 Fabric Mart Fabricistas: Made By A Fabricista: Kathy Sews a Cape! 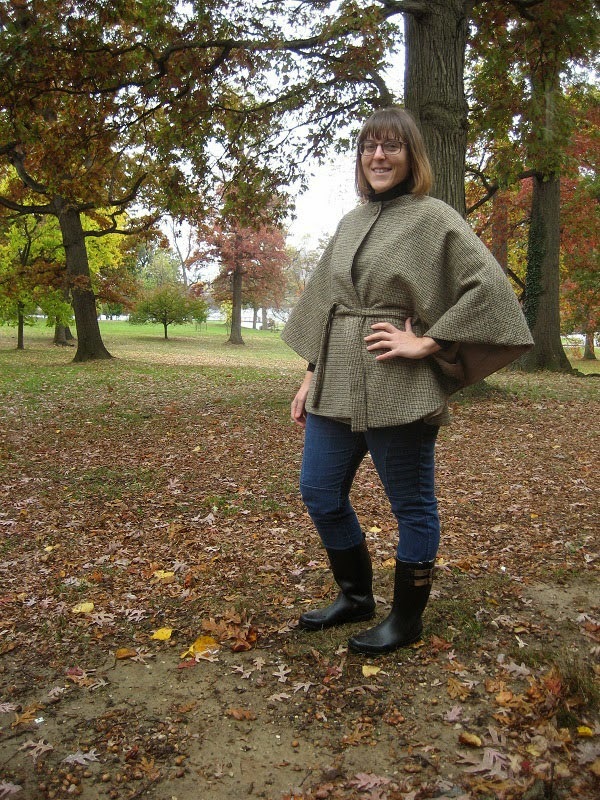 Made By A Fabricista: Kathy Sews a Cape! I am excited to introduce our next Fabricista, Kathy from Kathy Sews! You might remember Kathy from last year's Fashion Challenge. I had the pleasure of meeting Kathy in person this year when she made the trip up to our store from Baltimore, MD. She was just as warm and enthusiastic as she is on her blog and we are happy to have her join our team! 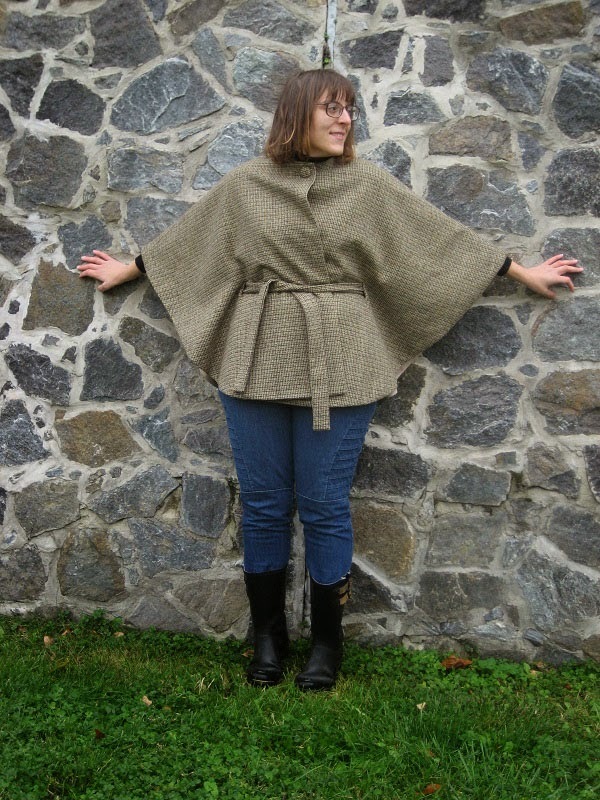 ~We all have been seeing capes everywhere for fall. I wanted to sew one up with a belted waist, flattering my pear shape much more than many of the fuller styles I've seen and tried on in stores. I also wanted one that allowed for easy arm movement. 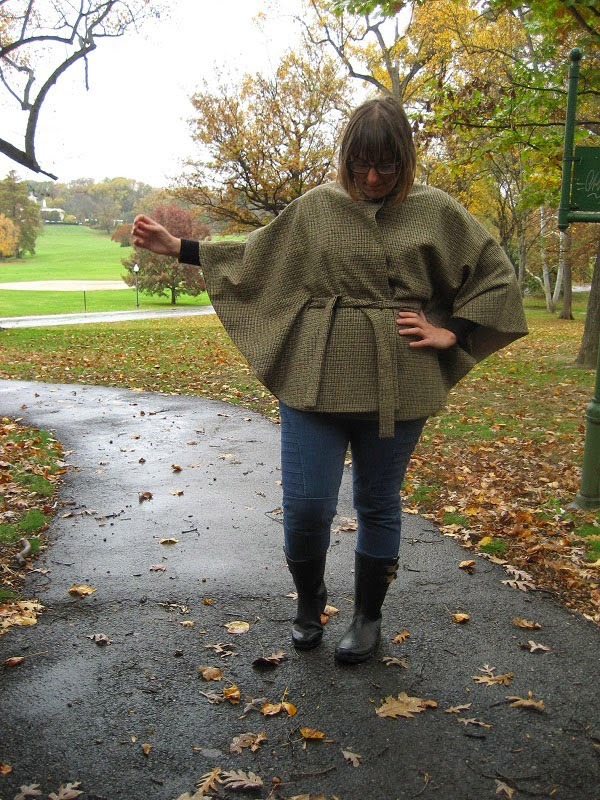 Last year I sewed up a Burda cape for the Fabricista Fashion Challenge that I loved, but I feel a little overwhelmed in it and my arms and hands are trapped inside when I wear it. 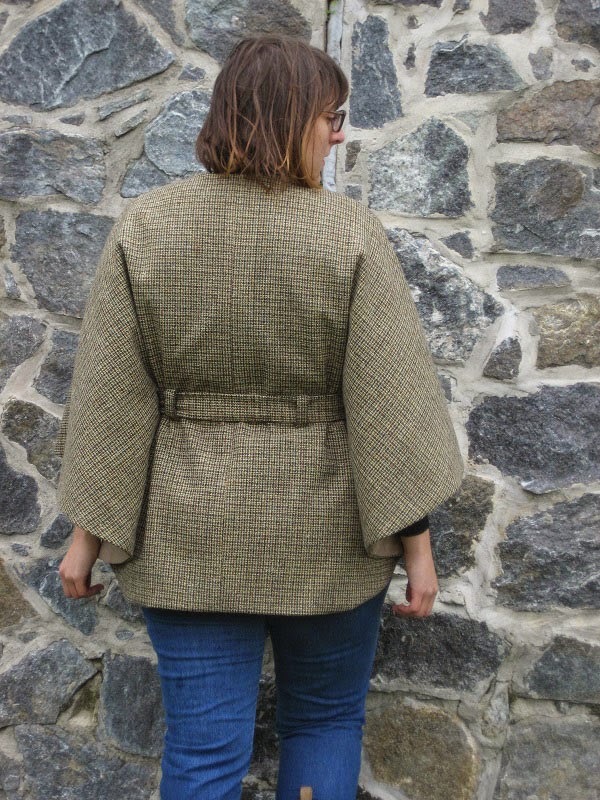 I used Simplicity 1775 for this project and it worked out really nicely... I can drive in it, grocery shop, use my hands and arms normally and just basically function while I wear it. for my fashion fabric. I opted for a lightweight beige poly lining material from Fabric Mart found here... luckily Lisa, at Fabric Mart, was super helpful to suggest the perfect shade of lining to match my woolen material. The pattern I used is quite simple and easy to sew up but it really needed some tailored elements. Even though the pattern suggests only to interface the neckline, I fully interfaced my fashion fabric with a black fusible knit tricot interfacing I had in my stash (you can see in the photos). It gave the material a nice weight and drape. 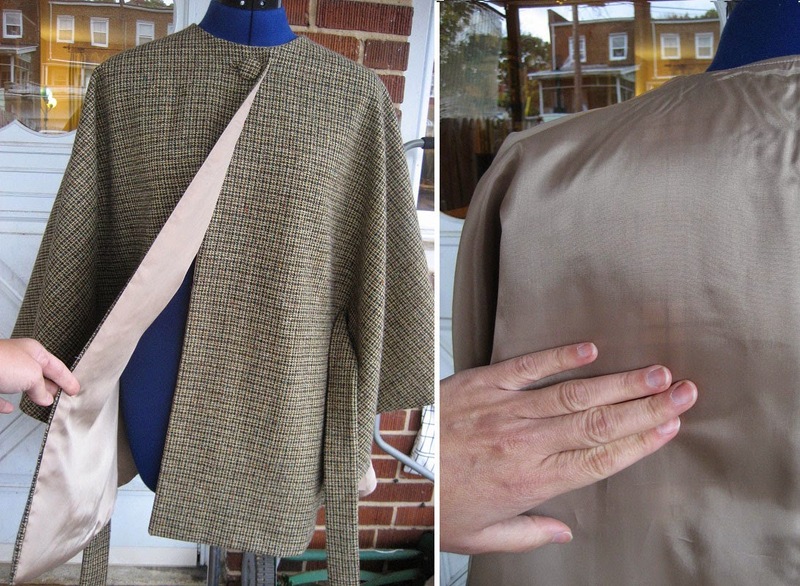 I found this great blog post on Fashion Incubator some years back discussing the benefits of fusible knit interfacing and why it's a good idea to just go ahead and fuse it to your whole dang coat (or cape as my case is here.) I fully interfaced my belt with the same stuff. I also wanted to add more warmth so I pulled out a lightweight plaid cotton flannel I had in my stash and interlined my cape. I was a little bored by Simplicity's plain finish to the button hole and belt holes. I pulled out my handy copy of Tailoring by The Singer Sewing Company to remind me how to do button holes-- it's an invaluable reference for sewing tailored coats that you can buy it for about $5 online! It difficult to see in the photos but I made a bound button holes for each opening. It's a detail most will never notice with the colors and weave of this fabric but it makes me happy to know they are there! Then I had to make my own covered button, too. I was really super pleased with how the woolen fabric sewed up, it pressed like a dream and was so easy to work with. I'm not nearly as excited about the lining, I must confess. I've never used a poly lining like this before and wanted to give it a shot. It's a little more transparent than I hoped, I can see my plaid interlining through it-- it's not really ever going to be noticed unless you flip the cape inside out, so it's not the end of the world. Also, I had some trouble hand sewing the lining around the bound button/belt holes inside. I am nervous those spots will wear quickly so I squirted a little Fray Check around the lining area of the button hole, getting up into the raw edge under my stitches. But I do like the way it's nice, smooth and slippery over my clothes letting the cape drape nicely over me. I cut a medium for the neckline and extended the sleeve and hem length to an XL. It was about 48F with a breeze and a some raindrops while I took my photos-- it kept me comfortably warm but my hands really needed something to cover them. I am head over heals for this cape! It's totally wearable, I don't feel like I'm wearing a monster-sized tarp over me and is so much like wearing a lightweight coat. 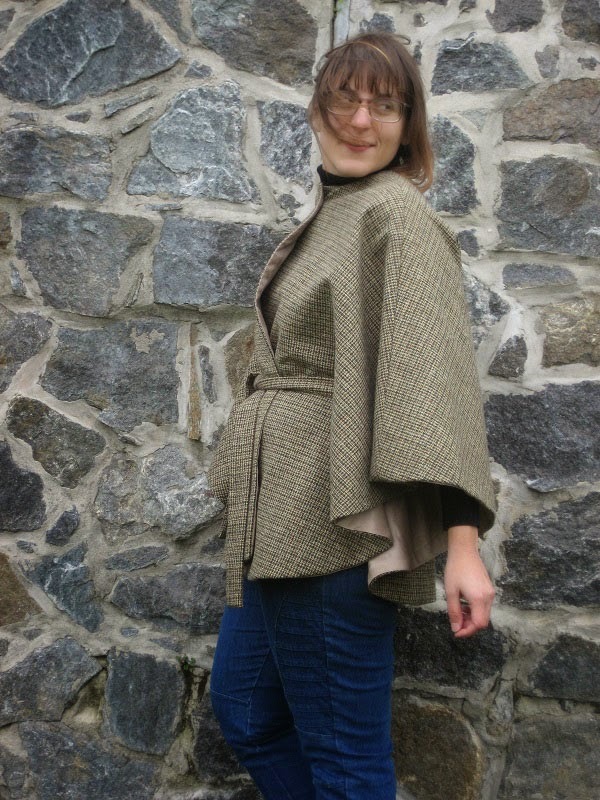 The classic tweed look and neutral tones of the fabric is perfect with jeans or leggings. Fusing the interfacing on the entire cape took forever, the bound button/belt holes added way more time to my project but it was totally worth it!! This will be worn a lot before fall is over. Thanks so much Kathy! I especially loved the covered buttons. We can't wait to see what you come up with for next month. Would like to you to see your Fabric Mart creations here? If so please email fabricmartblog@gmail.com for a chance to be a guest blogger. It looks wonderful! And I am very impressed by how you added those tailored details - small things can make a big difference. I just might need to whip up a cape after seeing how nice yours looks! Gorgeous cape! You did such a great job with the bound button/belt holes. The belt makes this one have a very flattering shape on you as well. I love your cape. I want to make one now! What Are Your Fall Sewing Plans?